The portrait of Sister Dora by W. Munns that hung in the committee room of the Cottage Hospital. 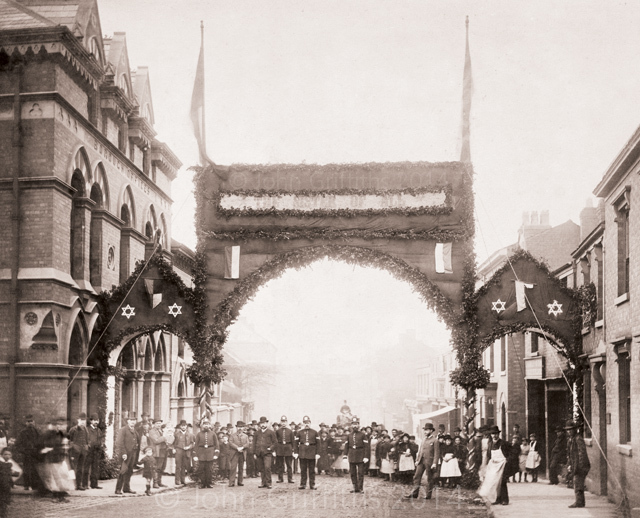 By all accounts, Monday 11th October 1886 in Walsall was a dismal day so the photographs show us that recorded the days events. A heavy mist hung over the town, a combination of the onset of autumn and the filthy atmosphere created by the town’s industry that always seemed to be there, but that day the people of Walsall turned out in their thousands to honour a good person who put the community first. 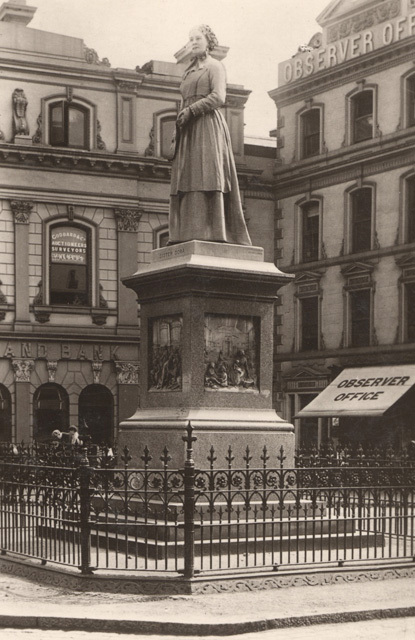 It was the day Walsall honoured Sister Dora by unveiling a grand statue of her on The Bridge in front of the George Hotel. Sister Dora was revered by everyone in the town, rich and poor, most definitely the latter, during her relatively short stay. Born Dorothy Wyndlow Pattison in 1832 in Hauxwell, Yorkshire she first came to Walsall in January 1865 for two months. In November that year she returned to Walsall permanently and the work that she was so well known for began in the Cottage Hospital in Bridge Street. In 1868 the hospital moved to new premises at The Mount. March 1876 saw the hospital move again to temporary premises in Bridgeman Place when the premises at The Mount were closed due to infection. Plans were drawn up to build a new hospital on the corner of Wednesbury Road and Vicarage Place which was known in later years as the General Hospital. 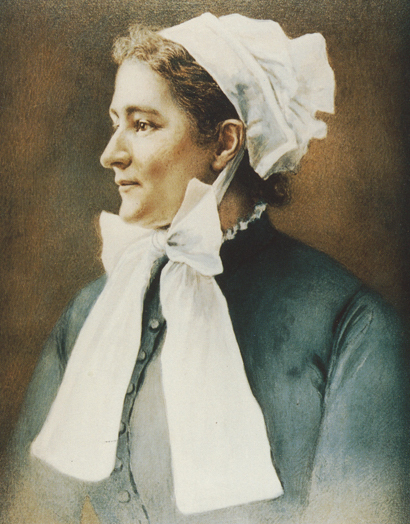 Her work continued for thirteen tireless years before she succumbed to breast cancer at the age of 46 on Christmas Eve 1878 and was buried four days later in Queen Street Cemetery, another day the town stood still. Sadly she never saw the opening of the new hospital on 4th November 1878 as she was too ill to attend the ceremony. Rather surprisingly it took the town eight years before a permanent monument was erected, one cannot help but think had the poor had the money, an honour would have been bestowed much earlier! The statue in 1912 surrounded by a bank, the Observer Office and the George Hotel. The sculptor given the commission was Francis John Williamson (1883-1920) of Esher in Surrey who was said to be Queen Victoria’s favourite sculptor. Williamson favoured the classical style of sculpture and many pieces of his work can be found around Britain including four studies of Queen Victoria at Hastings, Croydon, Wakefield and Paisley. The statue was the first in Britain to a lady not of Royal blood and cost 700 guineas. Carved from a 20 ton block of Sicilian marble it stood 7 feet 10 inches (2.4m) high on a 7 foot (2.1m) high pedestal of Peterhead red granite. The figure of Sister Dora herself stands appropriately on a small platform of Yorkshire stone. The procession began at the Cottage Hospital shortly before 2.00pm under the command of Sergeant-Major Purvis, one of the last heroes of the Charge of the Light Brigade at Balaclava, who led the Walsall troop of the Queen’s Own Yeomanry followed by the Rifle Volunteers under J. C. Clarke. Reading through reports of the day in newspapers it would appear that every institution in the town was represented in one way or another, even down to Clarke’s Brush Works of Pelsall and St. Jude’s Drum and Fife Band. As well as all the institutions many individuals were in attendance including the Mayor, Alderman Thomas Evans and numerous names from the business world. Confusion about the total number of people in attendance was inevitable, The Walsall Free Press quoted from 10,000 to 40,000, whatever the numbers the people of Walsall did her proud that day. The route they took around the town was as follows:- Bradford Street, Park Street, Stafford Street, Littleton Street, Bridge Street, Upper Rushall Street, High Street, Digbeth and finally The Bridge. Each of the streets mentioned were decorated with bunting, flags banners etc thanking Sister Dora for her work. Harry Hallier, a photographer and artist of 242 Stafford Street, took photographs of these street decorations and I am fortunate enough to have two of these images of taken in (Upper) Bridge Street. The location on (Upper) Bridge Street was at the junction with Goodall Street and the views are looking down the street towards Lichfield Street and upwards to Ablewell Street. 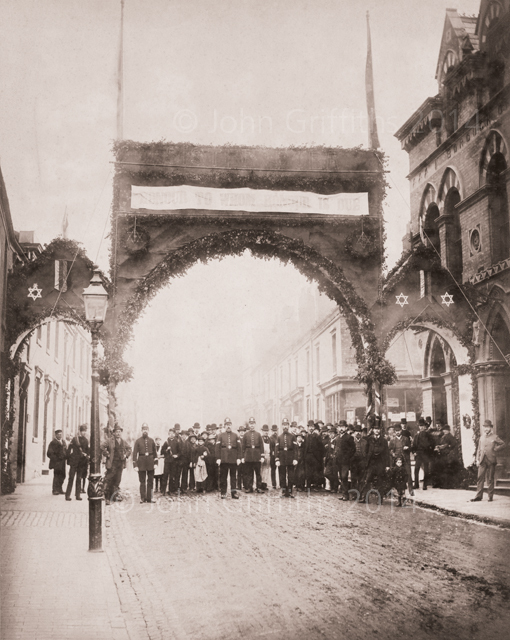 The arch on Upper Bridge Street looking towards Lichfield Street. The imposing building on the left, on the corner with Goodall Street, is the Borough offices. It was occupied years later by the MEB as a service centre before being demolished. The arch looking the opposite way up to Ablewell Street. Goodall Street is to the right where the shop window is. 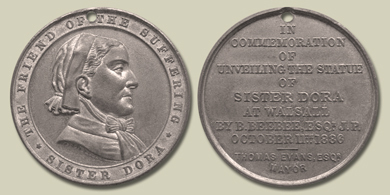 The front and back of the medal struck to commemorate the unveiling. When Sister Dora was taken ill on 29th September 1878 at the Queen’s Hotel, Birmingham she refused all offers of help and demanded to be returned to Walsall, saying “let me die among my own people”. Her wish was granted, she was taken back to Walsall where she did indeed die among her own people. Finally eight years after her death, on that damp Monday afternoon in October the town’s people, rich and poor, thanked her with everything they had. Even though a holiday atmosphere engulfed the town there was little need for police as “the absence of ill conduct of every kind, particularly drunkenness, was conspicuous by its absence.” Well done Walsall, she would have been proud. 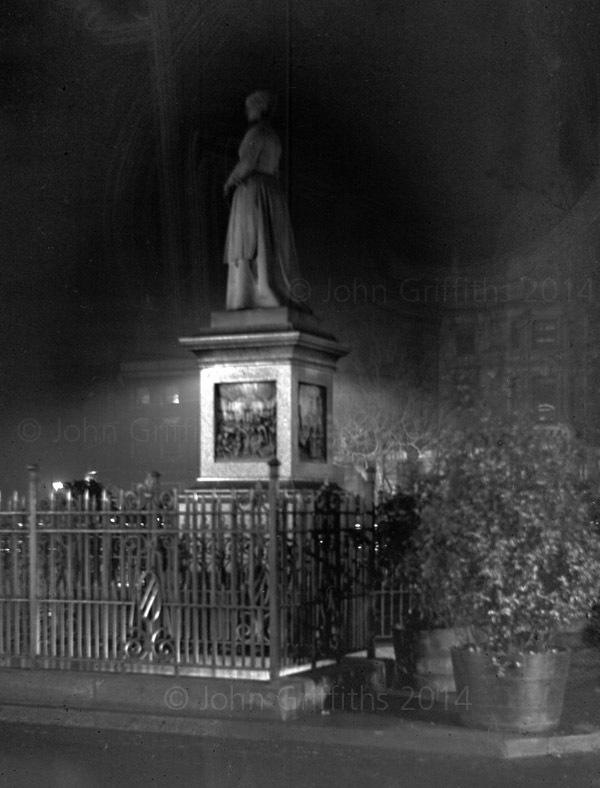 An unusual nocturnal view of Sister Dora’s statue taken by Frederick Blanchard c.1925. You are currently reading Sister Dora….the town thanks you at Walsall Life.